English : First flight of the nederland company KLM aircraft Douglas DC-4 Skymaster PH-TAR from Rotterdam to New York on 1946-05-21. English : Wikipedia Founder Jimmy Wales speaks to Bread and Roses TV about Raif Badawi and the need for pressure on the Saudi Government to release him and others for 17 June 2015 Day of Action for Raif. English : Robocasting an array of 1mm alumina micropillars. English : Courtship of sand lizards (Lacerta agilis). A Royal Air Force Chinook helicopter and a Royal Marine rigid-inflatable boat (RIB), off Studland Bay, Dorset, UK. English : A Royal Air Force Chinook helicopter and a Royal Marine rigid-inflatable boat (RIB), off Studland Bay, Dorset, UK. English : First flight of the nederland company KLM aircraft Douglas DC-4 from Rotterdam to New York on 1946-05-21. A dual breed (beef and milk) cow with bell near Oeschinen Lake, Switzerland at an altitude of 1575 m photographed July 7, 2009. The breed is most likely Swiss Fleckvieh, alternatively Simmentaler-Fleckvieh or another dual breed. English : A dual breed (beef and milk) cow with bell near Oeschinen Lake, Switzerland at an altitude of 1575 m photographed July 7, 2009. The breed is most likely Swiss Fleckvieh, alternatively Simmentaler-Fleckvieh or another dual breed. English : Video of ACA Penetrator P-10 or P-15 Warning / Civil Defense Siren Test in "Alert" then "Attack" for Severe Weather Awareness Week. Recorded in Crystal, MN., USA. Looking up at the ceiling in the Miners' changing room in Rammelsberg Mining Museum, Harz, Germany. Work clothes are suspended from wires. English : Looking up at the ceiling in the Miners' changing room in Rammelsberg Mining Museum, Harz, Germany. Work clothes are suspended from wires. English : Arrival of a train of the Wuppertal suspension railway in station "Wuppertal Hauptbahnhof". English : Male human head louse, Pediculus humanus capitis. English : Japanese military submarine JS Mochishio departs Pearl Harbor after participating in RIMPAC, the world's largest international maritime warfare exercise, 6 Jul. 2010. Morning view of Kukenan and Roraima tepuis, from Tëk river camp, Gran Sabana, Venezuela. English : Morning view of Kukenan and Roraima tepuis, from Tëk river camp, Gran Sabana, Venezuela. English : This sequence gives a close-up view of a spectacular image of the southern spiral galaxy NGC 300 that was taken was taken using the Wide Field Imager (WFI) at ESO’s La Silla Observatory in Chile. Huge numbers of the galaxy’s component stars are visible across the entire image and much detail can be seen in the red and pink star-forming clouds of dust and gas that mark out the galaxy’s ragged spiral arms. English : Manhatta (1921) film - a portrait of New York City by painter Charles Sheeler and photographer Paul Strand. La Belle Otero, by Jean Reutlinger. English : La Belle Otero, by Jean Reutlinger. English : A St John ambulance travelling south on Cumberland Street with lights and siren in Dunedin, New Zealand. Indian vultures (Gyps indicus) in their nest, Orchha, Madhya Pradesh, India. English : Indian vultures (Gyps indicus) in their nest, Orchha, Madhya Pradesh, India. English : A 1939 loom working at the Mueller Cloth Mill museum in Euskirchen, Germany. Delhi, India, portrait of a man. English : Delhi, India, portrait of a man. English : Kayaker surfing a standing wave in Great Falls National Park. Interior of the Cathedral of Amiens, 1842, oil on canvas, by Jules Victor Génisson. Displayed in the Pinacoteca do Estado de São Paulo. English : Interior of the Cathedral of Amiens, 1842, oil on canvas, by Jules Victor Génisson. Displayed in the Pinacoteca do Estado de São Paulo. English : Speckled bush-cricket (Leptophyes punctatissima) on Calendula. Filmed in Germany. Crab Xantho poressa, female at spawning time, carrying eggs under her abdomen. The Black Sea. Ukraine. English : Crab Xantho poressa, female at spawning time, carrying eggs under her abdomen. The Black Sea. Ukraine. English : Catching a coconut crab (Birgus latro) alive on Suwarrow Atoll in 2010. A mass grave at Estépar (Burgos) which contains twenty-six republicans who were killed during Spanish Civil War. 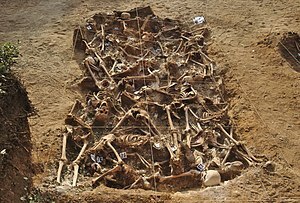 English : A mass grave at Estépar (Burgos) which contains twenty-six republicans who were killed during Spanish Civil War. English : Swing bridge over Almarestäket in Sweden. English : Freiburg im Breisgau, Baden-Württemberg, Germany (time-lapse). High above Tocopilla, Chile, one of SQMs Boxcabs coasts downhill to the Reverso switchback. English : High above Tocopilla, Chile, one of SQMs Boxcabs coasts downhill to the Reverso switchback. English : Holt Castle was built in the late 13th century and was a treasure house for King Richard II. Little survives today, but a grant from the Castle Studies Trust has allowed to recreate how it would have appeared c1495. English : Students giving a presentation about Roman baths. English : Sikh man, Agra, India. English : Royal Swedish Army Band on Norrbro. Panoramic view of Moros, Zaragoza, Spain. English : Panoramic view of Moros, Zaragoza, Spain. English : Square and market place Jemaa el-Fnaa in Marrakesh, Morocco, late afternoon on Sat, 19th October 2013. A merged stack of confocal images showing actin filaments within a cell. English : A merged stack of confocal images showing actin filaments within a cell. English : Speedsolving a standard 3×3×3 Rubik's Cube within 26.59 seconds with Fridrich Method. English : Presentation of part of Fencing junior world championship in Dourdan, France - 18.01.2014. This unnamed berg has been frozen in place by sea ice in North Star Bay. English : This unnamed berg has been frozen in place by sea ice in North Star Bay. English : Traditional Turkish tea prepared near lake Bafa, Turkey. Joan of Arc (1882) by Dante Gabriel Rossetti (1828–1882). English : Joan of Arc (1882) by Dante Gabriel Rossetti (1828–1882). English : Helicopter Bell 206, registration 4X-BDI takes off from airport in Rishon LeZion, Israel. Watch tower of the dam, Embalse de los Bermejales, Arenas del Rey, Andalusia, Spain. English : Watch tower of the dam, Embalse de los Bermejales, Arenas del Rey, Andalusia, Spain. English : Model of motorized excavator constructed from LEGO TECHNIC 8043 in action. 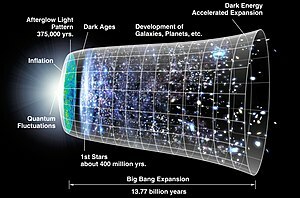 English : Timeline of the universe. Cheetah (Acinonyx jubatus) Two young cheetah brothers cleaning each other after having fed. Okavango Delta, Botswana. English : Cheetah (Acinonyx jubatus) Two young cheetah brothers cleaning each other after having fed. Okavango Delta, Botswana. English : Power trowels being used to smooth concrete.